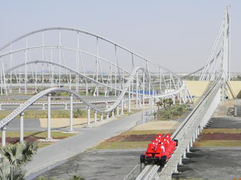 Welcome to Coasterpedia, the roller coaster wiki. 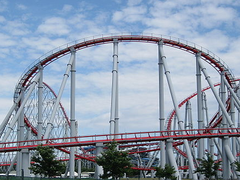 A collaborative roller coaster resource that anyone can edit. So far, we have 2,506 articles! 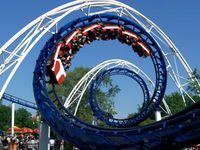 The NEW, independent Coasterpedia is a collaborative roller coaster encyclopedia that anyone can edit. 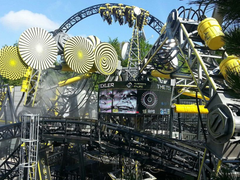 This website is built entirely from contributions by people like you - whether it's fixing a typo, uploading photographs or writing about your favourite roller coasters. If you enjoy editing, creating an account will help you keep track of your edits and communicate with other people. If you need help with anything, check out MediaWiki's help pages or talk to an admin. 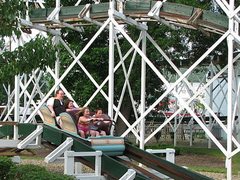 Custom Looping Coaster was a product offered by Arrow Dynamics. It spanned over twenty years, during which twenty-five were built. 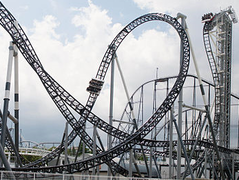 Arrow also produced two standardised layouts: the Corkscrew and the Loop & Corkscrew. 80,014 edits have been made to 2,506 articles and 8594 other pages. This works out at 7.208 edits per page. A total of 3,954 photographs, logos and other images have been uploaded so far. 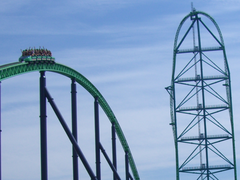 From Coasterpedia, The Roller Coaster Wiki - 2,506 articles since August 2009. This page was last modified on 31 July 2017, at 13:14.